Fleece Gallery – Working With Fleece Is Easy Fun! Here begins the fleece gallery. One of the most fun fabrics I like to work with is fleece. For one who enjoys that tactile sensation of a fabric that is soft and warm, fleece is ideal. Some of the best uses for fleece are warm up clothes such as sweat suits, and pajamas and bath robes, hats and scarves and gloves, stuffed animals and of course blankets. I even have some reversible coat patterns that recommend fleece as a good fabric for the garment. Some quilters even use fleece as the inner layer or batting layer of the quilt, even as the actual quilt fabric. Fleece is a fabric that has many uses. I really love fleece blankets, because they are the easiest of any project to construct. All you need to create a blanket is a fleece panel and blanket binding. You don't even need a pattern! Creating a fleece blanket is a good project for a beginning sewer, and is especially good for kids and teens. Fleece blankets also make excellent inexpensive gifts. Fleece is especially nice to create items for babies and toddlers from clothing to crib items. When purchasing fleece it is a good idea to buy no pill fleece, which is good reason to purchase fleece panels which are generally no pill. Although in general even no pill fleece will pill over time, the pilling is much less with no pill fleece, thus making no pill fleece best for constructing items such as blankets which generally receive a lot of usage. Fleece is inexpensive because there are always sales on fleece and these sales occur all year round. One good way to keep fleece looking good and delay pilling is to periodically use a lint brush to smooth the fabric and remove lint. The fabric should be brushed on both sides to preserve the look of the item. By taking good care of our fleece items we can enjoy the beauty of fleece for many years to come! this beautiful rose print is only one of many. 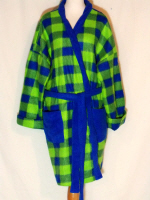 Fleece makes great bath robes as well, both warm and cozy! 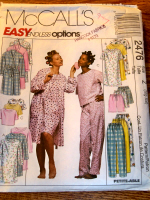 This fleece robe was created using McCall's pattern 2476.